He boasted about a woman in his own party: "contrary to Manon, she doesn't have a moustache." Parti Quebecois Leader Jean-Francois Lisee speaks at a news conference marking the end of the fall session on Dec. 8, 2017 at the legislature in Quebec City. MONTREAL — The head of Quebec's official opposition apologized Monday for making fun of a female politician's conspicuous — and relatively famous — fuzzy upper lip. Parti Quebecois Leader Jean-Francois Lisee told reporters he wasn't trying to ridicule his gender non-conforming colleague in a radio interview broadcast Sunday night. Rather, Lisee said he was comically affirming that Manon Masse wears her salt-and-pepper lip hair as a political statement. Masse, elected in 2014 with the left-wing political party, Quebec solidaire, worked as a feminist and LGBTQ activist before entering politics. She wears her facial hair proudly and has told interviewers on several occasions she refuses to adhere to society's heteronormative standards about beauty or how women should dress and look. A portrait of Canadian politician Manon Masse taken in Montreal on April 3, 2015. Quebec solidaire is arguably the most progressive and left-leaning party that holds seats in Quebec legislature. Instead of having leaders, the political formation has one female and one male "spokesperson." 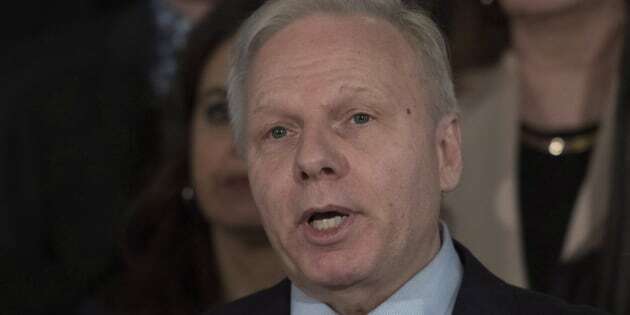 During the Radio-Canada interview, Lisee was asked about his recent decision to appoint Veronique Hivon, a well-liked politician in Quebec, to be the PQ's deputy leader. The move was seen as an attempt by Lisee — whose party is lagging in third-place in opinion polls and whose leadership is being constantly questioned — to add a popular presence alongside him for the fall's provincial election. Hivon's appointment was not inspired by QS's model, he stated. "I am the leader, and not a spokesman," he said, referring to how QS calls the heads of their party. "Veronique is the deputy leader, not a spokesperson. "Moreover, contrary to Manon, she doesn't have a moustache." Social media lit up after his statement, and Lisee quickly took to Facebook to apologize. He did so again on Monday, adding he tried in vain to contact Masse directly. The bad vibes between the two parties are palpable. Lisee had been trying to woo members of QS into a political union ahead of October's election. QS roundly rejected party's advances during its convention last May. The party's male spokesperson, Gabriel Nadeau-Dubois, a well-known former student activist, said Monday he didn't think Lisee's joke was very funny. Masse has not yet commented publicly on Lisee's lippy comment.